There is a ‘CP’ in the picturesque and idyllic hill station of Kalimpong in Bengal that no visitor would have never heard of. And no, the ‘CP’ here is not the acronym for a replica of the iconic Connaught Place in Delhi. The gentle townsfolk refer to it in hushed tones, and with a fair amount of trepidation and resentment. But they seem resigned to having this ‘CP’ in their midst. Kalimpong’s ‘CP’ is a neighbourhood on the shorter route from the town to the small settlement of Melli which lies by the fast-flowing Teesta river in the valley below. It is populated by mostly new settlers – masons, carpenters, car mechanics, labourers, rag-pickers etc – who have unsettled the gentle townsfolk. These settlers are all clad in lungis or short pyjamas, long and dirty kurtas, sport skull caps and have flowing beards with shaven moustaches. Most converse in the rustic Bengali spoken in some districts of Bangladesh, while some also speak in Bihari. The ‘CP’ they have made their home is the acronym for ‘Chota Pakistan’. These new settlers – the influx started very slowly around four years ago but has picked up pace over the past few months – have triggered alarm in the Gorkha-dominated hills in north Bengal. Alarm that they are being deliberately settled in the hills in order to alter the demography of the area and to break the dominance of the Gorkhas over the Darjeeling Hills so as to weaken the dormant demand for a separate state of Gorkhaland. Kalimpong’s ‘CP’ falls under the Bhalukhop gram panchayat of Kalimpong I block of the newly-formed eponymous district. That locality had a population of around 6,000 as per the 2011 census. Today, the population has more than doubled and, say locals, the Muslim settlers form nearly 50 per cent of the area’s population. They are a highly conservative lot with their womenfolk attired mostly in burkas. Kalimpong district has also witnessed new settlements of conservative Muslims in Melli, Alagarah, Lava and Pedong. 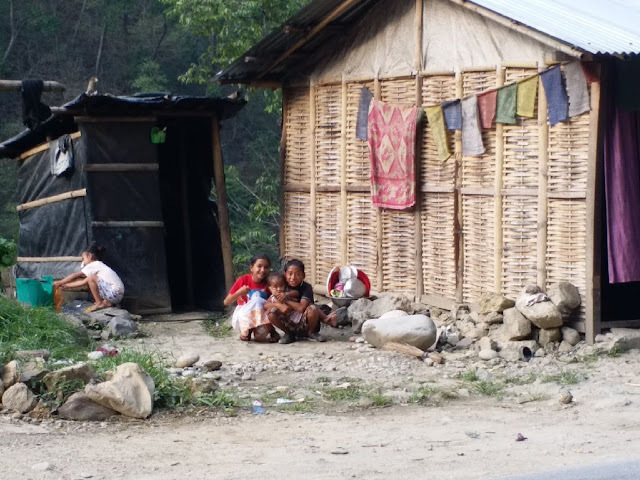 The Muslim influx into the hills, especially in Kalimpong district, has been happening slowly but very steadily over the past few months, say locals. Kalimpong has some very old, second and even third and fourth generation Muslims, mostly concentrated in the Thakurbari area of the town’s ward number 1. “The indigenous Muslims are different and one cannot distinguish them from the rest of the residents of the hills. They speak in Nepali, follow our lifestyle and are liberal. But the new settlers stand out with their clothes and also their attitude. They are extremely conservative, make no effort to mix with the rest of us, keep to themselves and, in fact, have been urging the old Muslim families here to become conservative,” said the local correspondent of a popular Bengali news channel who did not want to be named for fear of being victimised by the state government. This grave issue came to light last month when video clips of a group of skull-capped, kurta-clad and bearded young men alighting from a bus in Kalimpong town went viral. Rumours started flying thick and fast that these the men were Rohingyas, prompting Darjeeling Lok Sabha member of Parliament S S Ahluwalia to write to Prime Minister Narendra Modi requesting for a probe (read this report). Though the men were not Rohingyas, they hailed from districts of Bengal that have suffered complete demographic change due to large scale and illegal influx of Bangladeshi Muslims into these districts (Malda, Murshidabad, Nadia, South and North 24 Parganas and parts of some other districts). Kalimpong, known for its fine educational institutions set up by Scottish missionaries, its salubrious climate, flowers and British-era cottages and bungalows that dot the hills which offer a majestic view of the entire Khangchendzonga range, is in the grip of a fear psychosis of sorts. Accentuated by the presence of, in addition to the unwelcome Muslim settlers from the plains of Bangladesh, the large number of ‘workers’ from Islamic charities who have flocked to the town to raise funds during the ongoing month of Ramzan. A few hundred of these ‘workers’ – mostly young men and all attired in conservative Islamic dresses –present a somewhat odd spectacle in this town as they go to Muslim-owned establishments collecting donations for various charities. They do this in small and large groups and all of them collect money. “It is odd that all of them have receipt books and even when they are in a group, each one of them collects money. What is stranger still is that they visit these Muslim-owned establishments every day, often twice a day, and collect donations. When we ask, they say they are collecting donations for poor people, for orphans and for treatment of the sick. But to go to a shop or business establishment every day and collect donations daily is very strange and raises suspicions,” said a local leader of the Gorkha Janmukti Morcha which had spearheaded a prolonged statehood stir last year. Activists and preachers from Islamist organisations like the Tablighi Jamaat, which preaches a puritanical and austere form of Islam, have been flocking to the hills of north Bengal in a bid to influence the liberal indigenous Muslims there. The effect of their influence, says another local journalist who writes for a popular national Hindi newspaper, is being felt of late. “Earlier, the Muslim families who have been living here for generations were liberal and used to participate in our (Hindu) religious ceremonies. They used to take prasad and we also used to celebrate their festivals with them. But over the past few years, many of them have stopped celebrating Holi and Diwali with us and don’t take prasad anymore. This is a cause for concern,” he said. Some of the old-time Muslim residents have now started sporting skull caps, keeping beards and dressing up like conservative Muslims. “Some of them seem to identify more with their co-religionists who have settled recently from the plains than with us,” rued the scribe. Melli is a small town straddling both Bengal and Sikkim along the Teesta river and runs for a few hundred metres along the national highway connecting Siliguri to Sikkim. Rangpo, the main entry point to Sikkim, which is very strict about entry of outsiders into the state, lies about 20 kilometres from Melli. The river Teesta passes through the town, dividing the Bengal half of Melli from the Sikkim half. The Bengal portion of the town had about 200-odd households till a few years ago before Muslim families started settling there. “Till four years ago, there were no Muslim families here. Then three families came and started working as labourers and cleaners. Slowly their numbers grew and over the last nine to 10 months, more than 30 families have settled down here. The local police and administration protect them and we fear more Muslim families will come here,” said Birendra Pradhan, who runs a popular roadside dhaba. About 25 Muslim families – and each has a minimum of eight members, say the locals – live below the large concrete bridge that spans the Teesta river. “They are squatting on government land, but there is no move to evict them. They have even built a small mosque, but we have prohibited the use of loudspeaker from the mosque. We see the local police being on very friendly terms with them. And they all dress like typical Muslims in lungis and pyjamas, all have beards and the women wear the burka or the hijab. Very often, we see new faces and they (the Muslim families) tell us those are visiting relatives. But they stay on and slowly bring their families from the plains,” said Pradhan. The Sikkim part of Melli (on the west bank of the Teesta), does not, however, have any Muslim settlers and all residents there are Gorkhas. “Some of them tried to sneak into the other side of Melli a few months ago, but were promptly evicted,” Pradhan added. Gorkha Janmukti Morcha leaders allege that this gradual settlement of Muslims in the Gorkha-dominated hills is part of a sinister plan hatched by the Mamata Banerjee government. “These new Muslim settlers, unlike our Muslim brothers who have been in the hills for generations and support the Gorkhaland movement wholeheartedly, are beholden to Mamata Banerjee and will do her bidding. They will form a solid support base for the Trinamool and a precious vote bank for Mamata Banerjee. Her plan is to weaken the Gorkhaland movement by settling these people in the hills,” said a morcha leader, who would not be named for fear of inviting retribution from the state government. What is of equal, if not greater concern, is that Kalimpong houses many vital military installations, including the headquarters of an army division that is deployed along the strategic border with Tibet. Kalimpong is the gateway to the Jelep-la pass that leads to Tibet’s Chumbi Valley which is an important Chinese military base. Kalimpong is also next door to Sikkim whose geo-strategic location cannot be overemphasised. Sikkim also has a large Indian military presence and has many high-value military assets. Given all this, the presence of a large number of people of doubtful nationality who are, apparently, also Islamists raises grave security concerns. Another aspect which sets alarm bells ringing is that many of these new Muslim settlers have engaged themselves in vocations like hawkers, rag pickers, labourers, masons, mechanics, cleaners etc that allow them to go from place to place and even close to or inside vital installations without raising suspicions. “A strict vigil has to be mounted on these new settlers and a thorough background check run on them. If they are found to be of doubtful nationality, they should be deported from the hills immediately. And they should be kept under strict watch,” said the morcha leader. Ahluwalia is learnt to have flagged this concern in a recent meeting with Home Minister Rajnath Singh. But Muslim organisations like the Anjuman Islamia dismiss all these charges and suspicions. “Anyone belonging to any religion is free to settle anywhere in the country. All this talk about Muslims settling in the hills being part of a conspiracy against the locals is false. Muslims come here in search of livelihood and all who come are bonafide Indian citizens. None of them are hardliners. All they have come for is to earn a decent living,” said Maulana Akhtar Rehman, a community leader based in Siliguri. But the Gorkhas and other indigenous communities of the hills are not willing to buy such protestations. To them, the growing presence of men with flowing beards, skull caps, lungis and kurtas, and women in hijabs and burkas, present a threat to their way of life and to their dreams. And they suspect Mamata Banerjee of trying to marginalise them. Source: Jaideep Mazumdar is an associate editor at Swarajya. There is a ‘CP’ in the picturesque and idyllic hill station of Kalimpong in Bengal that no visitor would have never heard of. And no, the ‘CP’ here is not the acronym for a replica of the iconic Connaught Place in Delhi.